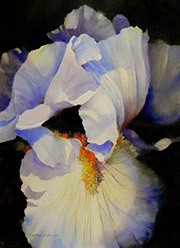 Linda Griffin’s watercolors have received honors for many years. She is an accomplished painter of flowers and landscapes, and has enjoyed painting on commission. Linda’s most recent work in watercolor features abstract compositions in jewel-like color combinations. She is an award – winning member of the North Carolina Watercolor Society. Morning Star Gallery shows Linda’s originals as well as her prints.